through to the next morning. 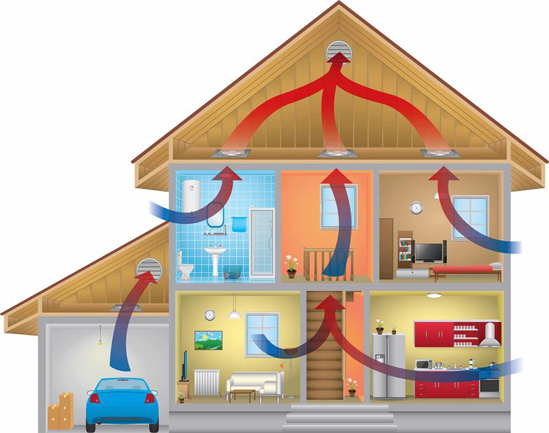 When the QuietCool whole house fan is turned on, the fan will pull the cooler outdoor air into your home, through your windows, across your living space, into the attic, and out the attic vents replacing the hot stale air. This helps cool the home and attic by up to 30 degrees, and sometimes more, allowing the home and attic to stay much cooler the following day. When using the QuietCool whole house fan, we recommend starting by cooling the area which will be most occupied. For example, in most family situations, the early evening is spent in the kitchen and family room area. Assuming this to be true, this is where you would want to start cooling. The cool breeze begins when a window or two is opened and the QuietCool fan is turned on. The cooler outside air will immediately begin to create a breeze inside the home making the homeowner feel up to 10 degrees cooler, and sometimes more, instantly. stay cooler throughout the day. and your privacy with your door closed. active breeze to be felt at each open window.